Whether it’s the blue little privacy dinosaur or the latest layout tweak in that blue bird or the mail-fail by the red+ giant, all these social media platforms are always evolving and trying to make their services more attractive to woo the user. 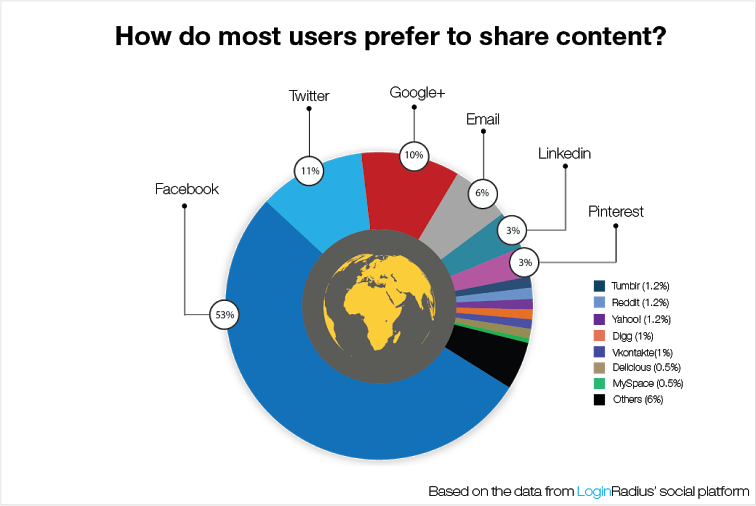 Social Login: According to a report from eMarketer 51% of social logins into various sites worldwide are through Facebook. And as per the data from LoginRadius more than 55% websites use Facebook login for the user authentication. 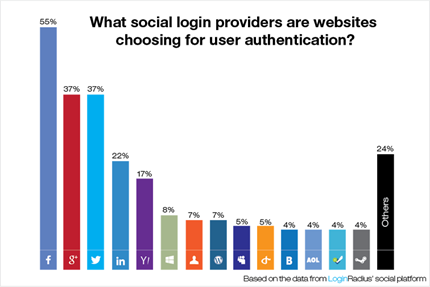 The use of Google+ and Twitter login for user authentication stand at 37%, whereas Linkedin has a nominal share of only 22%. So, the dominance of Facebook in social login simply indicates the popularity of the platform as a trusted authenticating option. Content Sharing: Facebook tops the list of global content sharing popularity. 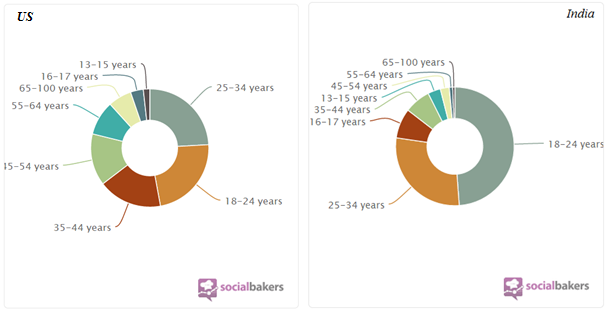 The data from LoginRadius shows that 53% of users prefer to share content on Facebook over other available platforms. Despite the fact that the organic reach of the page posts in FB are dramatically declining with the recently introduced news feed tweaks, yet content sharing in individual profiles are far higher in FB than rest of the platforms. 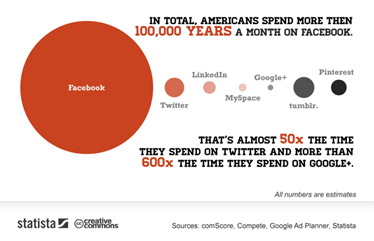 In total, Americans every month spend more than 100,000 years on Facebook which is 50 times longer than the time on Twitter. User-base: With highest user-base of nearly 1.23 billion monthly active users Facebook tops the list of number of active users. ‘Four generations together in a social media platform’ – Yes, that is Facebook. 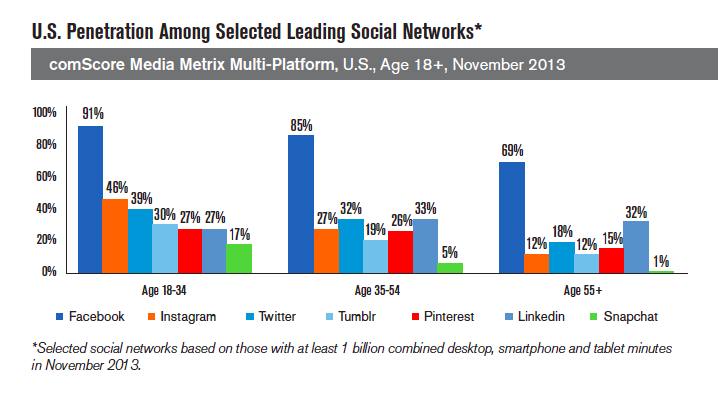 The number of younger population on Facebook is still bigger than most of the platforms combined together. Innovation vs. disruption: The key factor as in social media space is always the change. Change as I categorize, are of two types – innovation and disruption. For example, Google Glass is an innovation whereas Facebook’s WhatsApp or Oculus acquisitions are disruptions. Facebook occupies the top position in creating disruption in the social media space from its very initial acquisitions like Gowalla, instagram to the recent ones like WhatsApp, Oculus etc. Facebook’s deal with Skype in the year 2011 was also a disruption that competed with Google+ hangouts. In all the disrupting ways deployed so far Facebook has been successful in sustaining the hype of change. And that definitely makes it the most dominating platform among others. Mobile Oriented: If you notice closely, from the acquisitions like instagram, whatsapp it is clear that Facebook has slowly become more of mobile oriented. From check-ins to messenger services it has covered a good lot of mobile internet landscape. As I predicted in my previous SMC clubhouse article, location based social media use has declined robustly; thanks to FB’s connected check-ins, ‘Traveling-to’ and opt-in real-time location sharing tool ‘Nearby Friends’. In the same way, the removal of FB messaging from iOS and Android to introduce messenger is another future oriented move to lower the social clutter on smartphones. Probably FB got this idea from the Google chat integration mess few months back. FB’s VOIP integration on messenger is really a welcomed step and obviously would serve the future. To mention, Google is clearly becoming a leader in virtual reality technology with Glass and the recent acquisition of Titan Aerospace – the drone makers. But that doesn’t make Google the leader in social media landscape. On the other hand, as per the reports from Financial Times Facebook is planning to step into financial services starting with Ireland. This ‘e-money’ would surely add a demanding dimension to the progress of entire social media landscape. With all these intact features, apps and continuous change in place Facebook will sustain against the criticism from certain self-made social media pundits. What do you think? Have you recently used FB for a social login? How’s your overall experience with Facebook? Do you care that a 3rd party gets the access to your social data with such a login?